SOLD The large glass stone has clay incorporated within. This unconventional technique of firing glass and clay together is one Ms. Freund developed and become known for. I have seen it referred to as "Elsearmic", a fusion of her first name and the word ceramic. 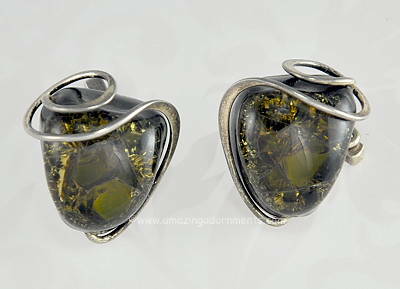 The dramatic glass is olive and it partially wrapped by swirling sterling silver wire. The hallmark appears on the reverse. Condition: Excellent vintage. Because Ms. Freund used shattered glass in her designs you might see tiny fractures or imperfections in the glass due to the process. This condition is well known and is not damage. Measurements: 1" long and 3/4" wide.